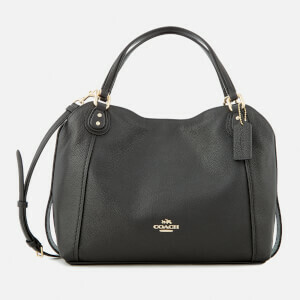 Women’s ‘Charlie 28’ carryall bag from New York fashion label, Coach. The beige handbag is crafted with luxurious textured leather and features a pair of top handles and an adjustable, removable shoulder strap for versatile styling. Inside, the open design is bisected by a zipped compartment with attached slip pocket for storing small items. Iconic gold-tone branding provides the finishing touch. Dimensions: H: 18.5cm x W: 28cm x D: 12cm. Handle Drop: 13cm. Strap Drop: 52cm.